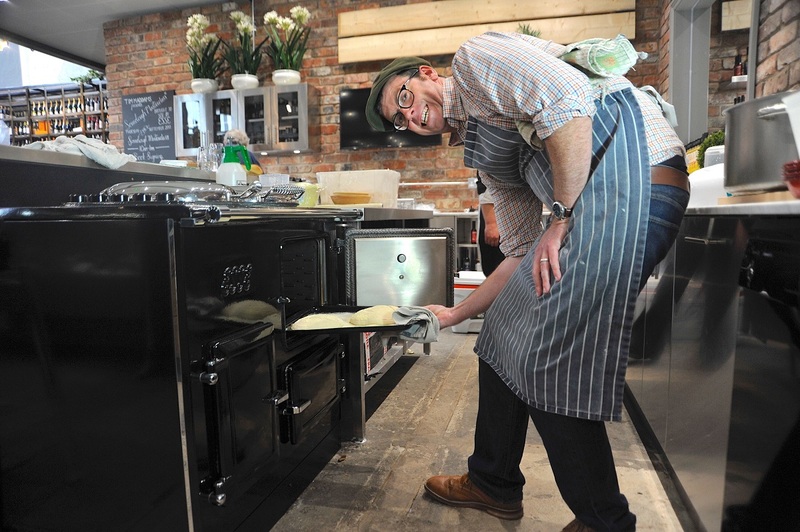 For former River Cottage head chef Tim Maddams, Real Bread really is the staff of life. Here he shares his passion and top tips. That first taste of home-baked Real Bread is a revelation for the uninitiated. Nothing beats the taste and texture of a fresh, home-baked loaf that’s still slightly warm from the oven. Serving it on the side transforms chunky winter soups into memorable meals and takes spring salads to the next level. A simple plate of toast is elevated to a thing of glory and herby breadcrumbs become a mainstay of your garnish repertoire. The time, thought, care and rhythm that flow when you have bread to bake is a force for good in life and the aroma of freshly baked bread is a healing tonic all on its own. Quite simply, I couldn’t live without it. I sometimes think we’ve lost that natural connection with our food, so we expect exact timings and precise instructions in our recipes, but baking bread isn’t like that. The best way to bake truly amazing bread is to develop a feel for the dough, kneading and the baking by experimentation and a bit of trial and error. There’s real joy to be found in the mindful process of making bread by hand and the very worst thing that can happen is the fruits of your labour end up in the bin or the dog - it’ll love you for it. More likely is that you’ll make something that looks lovely and tastes absolutely amazing. That sliced white loaf in the bread bin might last all week, but that’s because it’s full of preservatives. Get your own bread right and I guarantee that it won’t hang around that long, because the whole family will love eating it! If for some reason you do have leftovers, then there’s the multitude of uses for them, like a crunchy breadcrumb crust on a rack of succulent spring lamb. Establish a regular baking routine and the process and discipline creates a framework around which the rest of life just fits. Always use good quality flour. I find that organic is worth the premium when it comes to the texture and the flavour of the bread. I tend to use a 50/50 mixture of strong and plain flour to strike the right balance between structure and soft, springy lightness. When you first start baking at home, rather than slavishly following recipes to the letter, invest the time and try to connect with the dough. Get a feel for what’s happening and how the proving process is transforming the dough’s structure. Look for elasticity and spring as the yeast (or starter, if you’re making sourdough) works its magic. Professional bakers have two sayings that are worth remembering. The first is: watch the dough, not the clock. If dough is proving or baking more quicky or slowly than the recipe says, don't be afraid to shorten or increase the time accordingly. The second is: the wetter the better. Newcomers to baking often make a drier dough because it’s easier to handle, but if you want a light loaf that tastes divine, you need to be prepared to roll up your sleeves and get your hands sticky! When handling really wet dough, a dusting of semolina can help contain the stickiness. When making Italian breads like focaccia, lightly coating your hands with olive oil stops the dough sticking to them. When kneading the dough, be gentle and respectful of it. Don’t knock the air pockets out of it by kneading it to within an inch of its life. Use a circular, stretch, fold and tuck motion to keep those developing bubbles of air intact. Make sure the oven is up to temperature well before the dough goes in. For a really crusty loaf, get some extra steam into the oven. The easiest way to do this is by popping a pizza stone – or even an old heat-proof tile on the base of the oven while it’s pre-heating and then spray it with a fine mist of water from one of those small plastic garden spray guns. Repeat a couple of times in the first five minutes of baking and you’ll get a really robust, rustic, crunchy crust. If you’re lucky enough to use a traditional range cooker like the ESSE I use, the even heat convects and radiates around the oven really well. Once the cast iron gets hot, it stays hot. Even if you keep opening the door to throw in a bit of water to improve the crust, the temperature inside remains pretty constant. So what’s stopping you from baking your first loaf? Start with something simple, like my saffron focaccia, which will still taste great even if you don’t get it 100 percent perfect, and which you can adapt and customise to suit your tastes.